Today between meetings I have designed this one. I need a better 150cm range cooker graphic! This is a first draft for a customer who, so far, has emailed over some plans and we had a brief phone conversation about what to do with the space. So chances are this will change. I just needed to put something together to tempt them in. As "it's a 45 minutes drive to the showroom" so they needed to see what sort of thing we could do and an idea of cost before they made the journey! Re: Something from today. - Oak In-frame. 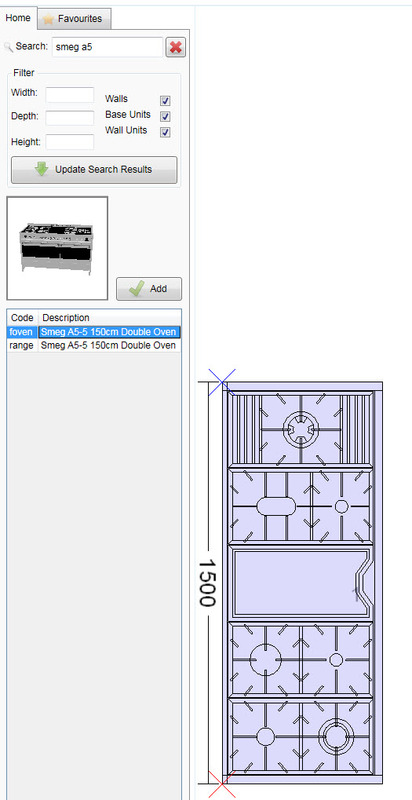 Nice first draft.... Would the Smeg A5-8 be a better range graphic for it? probably. Is that in the standard Articad Smeg cat. ? Are you using the default materials?? A great critique on image composition. Some very useful points on some already good renders. Any that look like they need improvement? Looks great. How long did this take to put together? unfortunately i find it always comes down to lack of graphics that is the biggest issue and giveaway that the image is just an image, not a photograph which defeats the whole point of photo-realism. Most look as though they need a bit more reflection. Increasing this for the likes of the oak material will reduce the "glow and orange" look it has. Jaynehiddleston wrote: Looks great. How long did this take to put together? Did the design throughout saturday between customers. So maybe 1.5 - 2 hours? Renders took about an hour per image. Daz, if i get chance ill try tweaking the reflection and see how it looks. Thats good going! I spend far too long trying to edit materials and improve realism......hoping V21 is going to have these materials as promised. Surely, 2 years on from when they announced it was nearly ready, they will be launching it at KBB? Hope you get the job, keep us updated! Jaynehiddleston wrote: Thats good going! I spend far too long trying to edit materials and improve realism......hoping V21 is going to have these materials as promised. Surely, 2 years on from when they announced it was nearly ready, they will be launching it at KBB? I've removed the customer and dealer info from under each image. The tall oven housing behind the door.... not really practical...?? 'copied' the other showrooms design now. With a few tweaks, and actually drawn the mantle/chimney as per the customers hand drawings - well close enough anyway. mister_mitch wrote: 'copied' the other showrooms design now. I am not seeing the images Mitch?? mister_mitch wrote: hows about now? What a difference in renders compared to the Burbidge ones! Great work! I still cant see the images.....just a circular box with a line through it? Really want to see how much better yours are Mitch! Do you charge for designs? hmmm odd. the security setting are set to share etc. so should be able to see? Jayne. No, I dont charge for design. Part of the reason this guy is starting to get on my t!ts is because we are at V3, I know he is speaking to two other showrooms and the client hasn't bothered to come in and see my product, pick a door range, worktop, etc - i'm only 45 minutes away! so all my designs and quotes are estimates based on what he's seen else where and what I think he is after / they have quoted. I think that's all i'm going to be doing for them now, they either come in or I bow out.